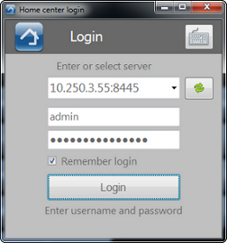 At first start up of the Home center client, the client will try to detect the Home center server or service located in your home network. When the HC server is running, the IP address of the computer where it is running will be added in the list (image). A username and password is required to login. The defaults login accounts can be found in the manual. If the HC server is discovered, the HC client will automatically make a connection and load the client configuration from the server. Checking Remember login will store the address, username and password in the local settings, so the next time you start the client, it will immediately reconnect to the server. Q: Why is my server is not discovered? Make sure both the computer where the HC client is running and where the HC server is running are properly connected to your home network. Start the HC server and hit ‘Retry’. In these last two cases you can hit ‘Setup’ and fill in manually the IP of the server. If for some reason the connection to the HC server is lost, the client will try to re-establish the connection when you operate a button. You don’t need to manually reconnect to the server.